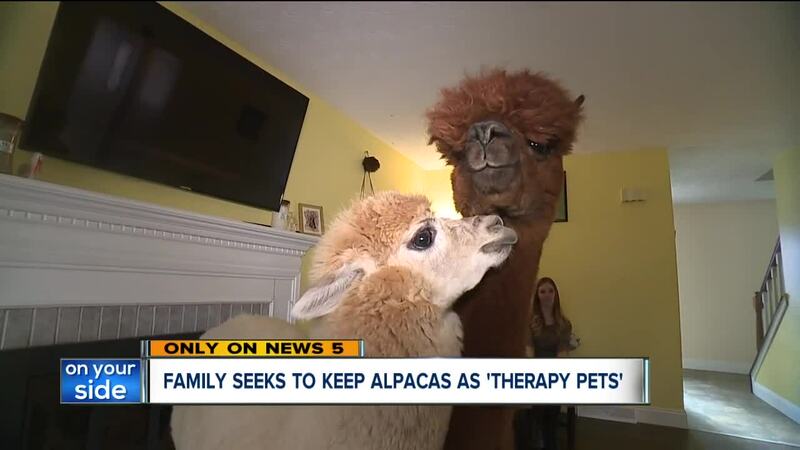 STOW, Ohio — One Ohio family has an approaching deadline to find new homes for their alpacas, which they consider emotional/therapy pets, after a neighbor claimed they were causing a nuisance in the neighborhood. Scott Westberg said the alpacas — mom Loratta and her vanilla-colored offspring Scooby — provide emotional support for his fiancée Sigga Jackson and her 12-year-old son, Max, both of whom have health conditions identified by medical professionals. "When she’s feeling down, she goes out there. She pets them. She feeds them. She comes back in a different person," he said. While the family has welcomed the alpacas into their home, a neighbor isn't projecting the same hospitality to the duo. Over the summer, city council heard from a neighbor that said Westberg created a nuisance situation with his choice of pet and the smells coming from his backyard. Westberg said he’s been cooperative with the city, going so far as to re-home two alpacas and cleaning up after the remaining duo on a daily basis. He also said the alpacas are indoor-outdoor pets, describing them as quieter than a dog with droppings that smell less than their canine counterpart. Still, the city is not budging, despite Westberg having proof they are registered as pets. A violation of the nuisance ordinance is classified as a first-degree misdemeanor, carrying a $150 fine. Westberg said he questions what kind of nuisance he is accused of, and to his knowledge, city officials haven’t verified his neighbor’s allegations against him, according to MyTownNEO.com. Westberg, who has been involved with raising llamas and alpacas for more than 20 years, said Loratta and Scooby are therapy pets without any agricultural use. Last year, when the original complaint was registered against him, Westberg told the Stow Sentry, “Embarrassingly, I did get busy at work and allowed too many days to go by without picking up after my pets in the backyard, so I did get a letter (from the city regarding the odor). I immediately put a plan in place to have my pets picked up after on a daily basis and emailed Rob to apologize for any inconvenience it may have caused him or anyone. I take pride in the way I take care of my family, property, employees and pets, and felt horrible I dropped the ball on that one." Westberg said after he resolved the issues, he thought they could stay. Scooby is registered as an emotional support animal and the family is working to get Loratta registered as a therapy animal through Pet Partners. Westberg and his family originally faced an Oct. 1, 2018, deadline to remove the alpacas but asked for an extension several times with the current deadline being February 17 to re-home the animals, according to MyTownNEO.com. “We want to and are willing to do anything within reason to make peace with (our neighbor), such as planting tall evergreen trees or extending our privacy fence into the woods,” Westberg said.